Moving to a foreign country can be one of the scariest, most exciting things you could possibly do. There's the excitement of experiencing a new culture, making new friends, and seeing a new part of the world. But with the excitement comes a little bit of sadness. This is the sadness of leaving behind the familiar as well as friends and family. Everyone says they're going to come visit, but living on the other side of the world, coming from a country who frowns upon its workers actually taking their holiday doesn't equate to a lot of people coming to visit. But occasionally, after about a year or so of planning, people will come to visit! We're pretty lucky here in Australia. We're guaranteed four weeks holiday per year. However, depending on how many visitors you have or when they choose to come and visit, you may not be able to get the time off. This is where good communication enters into play. Talk with your friends and family about how much time you would be able to get off during that time frame. Most times, people don't care if you have to work a bit while they're visiting. They're there to see you...and the country you live in! Always make time for surfing! It's always super helpful to have a plan! This plan can include activities you'll do together, ideas of what they can do solo (while you work...), and ways to get around the city. I'm not saying that it is necessary to plan out every single detail, of every single day, but put together a rough guideline of the things they would like to do. This way, you can group together activities that are on the same side of the city instead of trying to drive all over the town like a mad woman. The queen of all things planned and organised! While having a plan can be absolutely fantastic, it is important that you allow some flexibility. Life has a way of unexpectedly sending things awry. That’s ok, as long as you have the coping ability to reassess and adjust any plans. Most of the time friends and family aren’t going to crack the shits because you had an emergency at work or have to take care of some household chores. More than likely, they’re happy just to be spending time with you. If they’re super set on seeing various sites, send them solo or recruit your friends to help out. I’m not sure about you, but I love having my personal space. Often times, throwing off my routine can leave me feeling a little anxious. But when I have people coming to visit, that stuff doesn’t matter. I know I have a short period of time to see them and I want to make the most of it. Most of my friends visit for two weeks tops. Why would I waste that time being angry or avoiding them? Overcoming her fear because she loves me. Nothing is better than getting to share your new home with the people you love and care about. So be sure to make the most of the time you have with them. You may not get to do everything on your list but spending any time with loved ones is always worth it! Because who doesn't want to pat a koala? Hosting visitors can often feel like a lot of work. But overall, it is worth it! You get to share a little piece of your new life with the people who hold a special place in your heart. The time will fly by, and quickly you’ll find yourself wishing they would come back or stay for longer. To all my readers who have immigrated to a new country, how do you cope with visitors? I can see why friends would love to visit you! It sounds like you have a lot fun with your guests! I always ask people before they come to visit me and my surrounding area to write a lite of the Top 5 things they want to do so I have an idea of how to plan for them. Great ideas, Stephanie! How fortunate you are to have the opportunity to live in Australia! That's probably one of my top 5 places I would like to visit, but haven't yet had the chance. 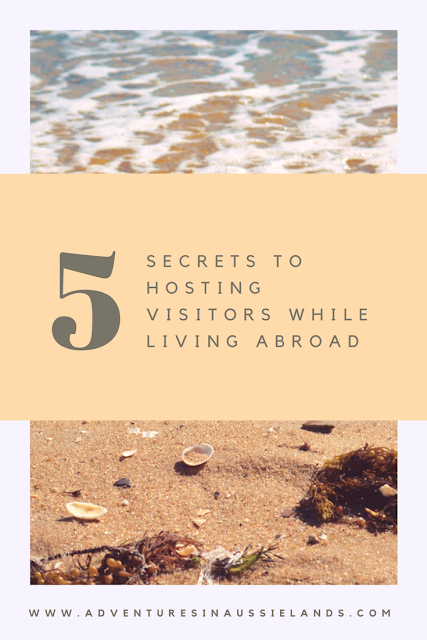 Planning, but leaving flexibility is what I strive for (when traveling with my family, or hosting guests), but that can be a struggle!